Did someone say best views in NYC for free? As a New Yorker, having spent most of my adult life here, I would lie to you if I told you that I ever tire of the breathtaking NYC skyline views, especially when they are free. It does not matter where in the world I go, how many scenic drives I take or views I’ve seen, there’s just something special about the views of NYC! 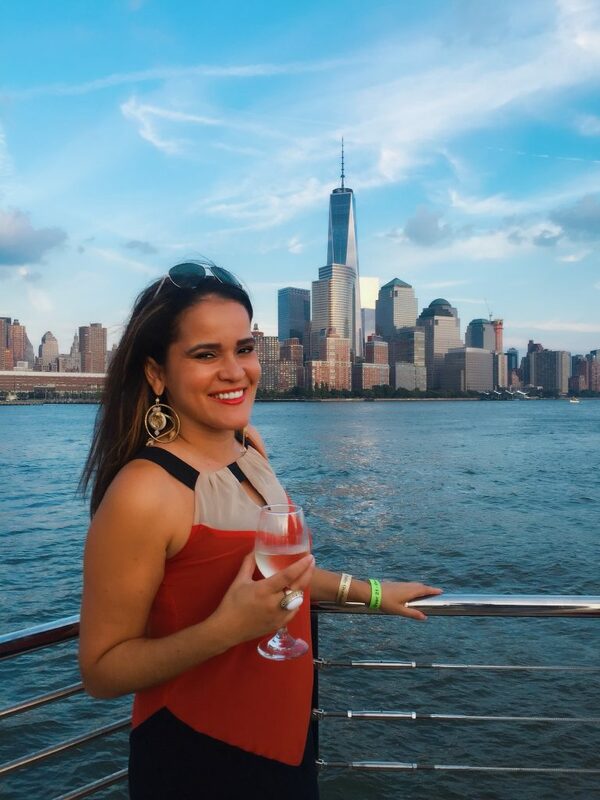 As a travel writer, I am always on the go and I can be described as a “purveyor of the perfect view” (I love rooftop bars and lounges with amazing views, restaurants on the water, unique locations and so on). But let me tell you that every time I travel, I really look forward to landing again in NYC. I love looking outside of the window to find my beautiful Empire State Building, Chrysler Building, Freedom Tower, Statue of Liberty, our bridges and so on. As I write this, I am in my other home-base in Europe and I grow nostalgic about my City that never sleeps, especially when the holidays (especially Christmas) will soon be here. There is nothing more spectacular than seeing the Empire State Building lit up during the holidays and seeing all the splendor of the lights across NYC from the top. YOU MIGHT ALSO LIKE: Tips from a New Yorker: Best Christmas Markets in New York City 2019, Where to Stay and Top Things to do during your winter holiday in NYC! 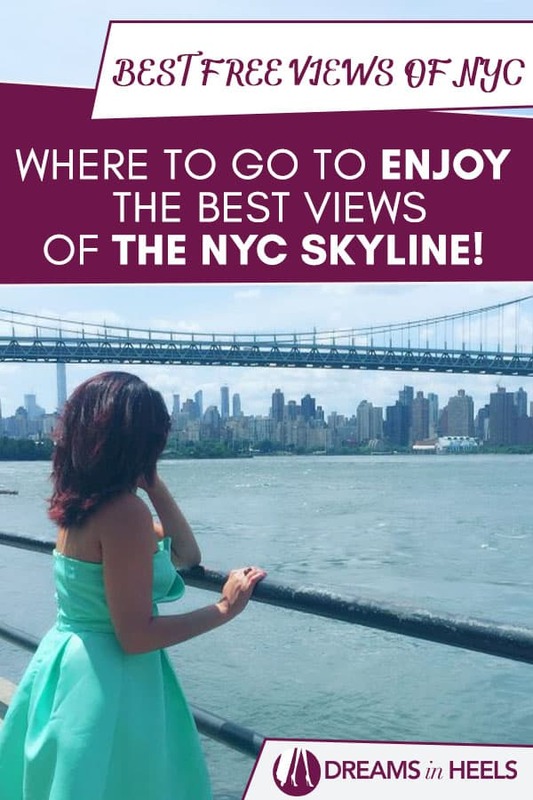 Well, let’s go back to what you hope to read more about: where to enjoy the best NYC Skyline views! Here is a list of spots where you can find the best views of NYC for free. 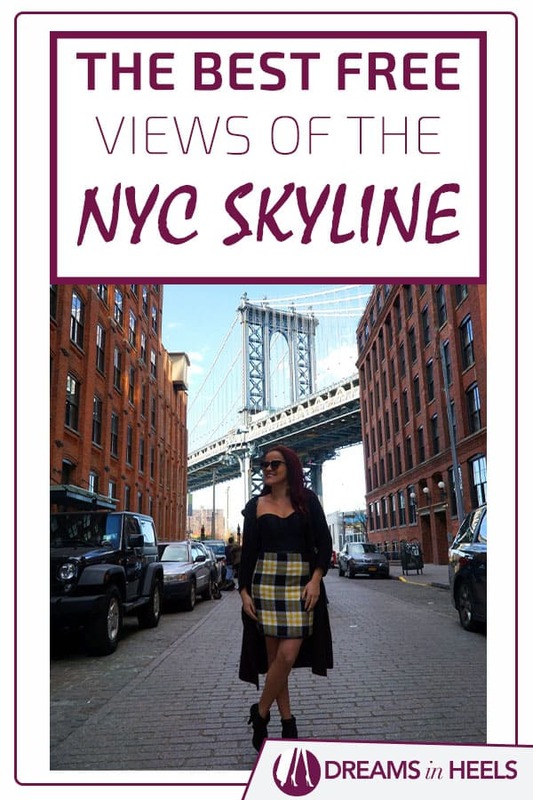 I know that most NYC first time visitors will usually pay the exorbitant fees at one or all of the most popular observation decks (The Empire State Building, One World Trade Center and Top of The Rock) and they are amazing but I also want you to know that there are other ways to enjoy the best NYC skyline views. Walking the Highline is a must while you are in NYC. 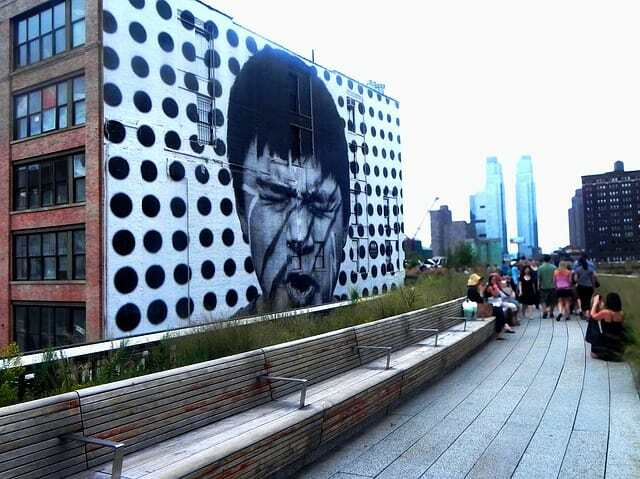 The High Line is a 1.45-mile-long elevated linear park, greenway and rail trail created on a former New York Central Railroad spur, located on the west side of Manhattan in New York City. It has a great history and it’s not far from some of my favorite places: The Chelsea Market, Meatpacking District and more. Tip: In that area you will find one of my favorite hotels, The Standard, which has a rooftop bar called Top of the Standard and arguably has one of the best views from any rooftop bar in New York City. 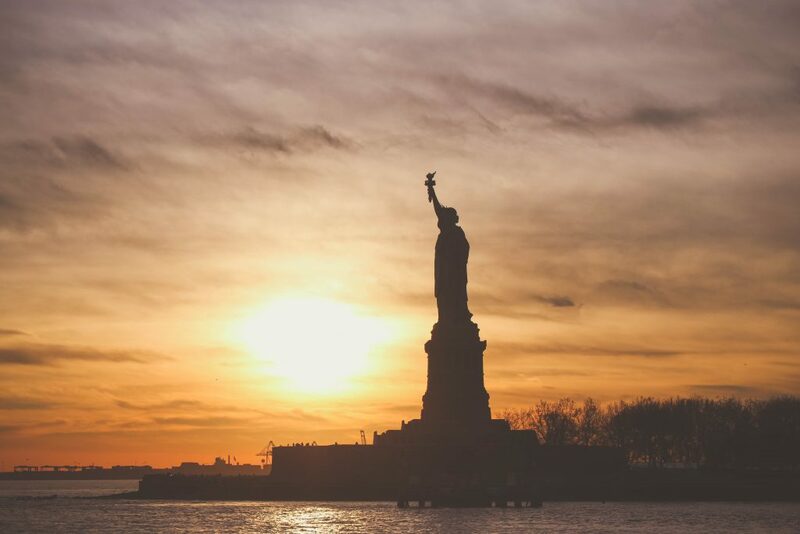 You can enjoy a 360 degree panoramic view overlooking the Lower Manhattan skyline, the Statue of Liberty, the Hudson River and the Midtown skyline. They also have a nightclub called Le Bain for those who enjoy the nightlife. You can get amazing views of the NYC skyline from many spots inside Central park and the reservoir. 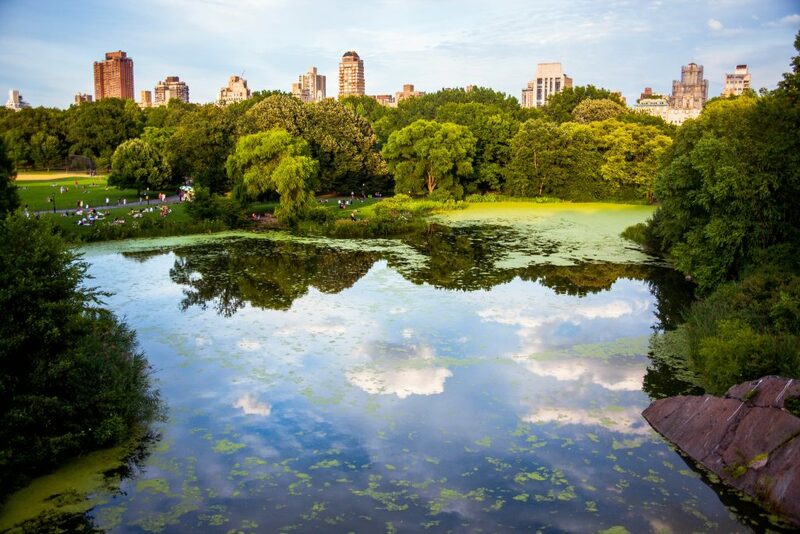 My favorite spots are Harlem Meer, The Great Lawn, the Belvedere castle, Bow Bridge, Jacqueline Kennedy Onassis Reservoir, among others. Go and experience them first hand and just lose yourself in the beauty of the Park. It is totally worthwhile! Rooselvelt Island is part of Manhattan, but it is connected to Queens by a bridge, on the East River and it gives you great panoramic views of the NYC skyline. It is a total hidden gem and a great place to visit especially when you are already in Queens. It is very easy to take an MTA bus from Astoria onto Roosevelt Island. Tip: For amazing views (at the cost of a Subway ride), take the Roosevelt Island Tram from Midtown East (60th Street and 2nd avenue). It takes you to the Island in just a few minutes but offers excellent views of Manhattan from above. Tram hours are 6:00am to 2:00am Sunday to Thursday and 6:00am to 3:30am Fridays and Saturdays. Governors Island is a 172-acre island in New York Harbor and it is part of the borough of Manhattan in New York City. From Governor’s Island you will also get great views of the southern-most tip of Lower Manhattan, but that is if you visit over the summer. 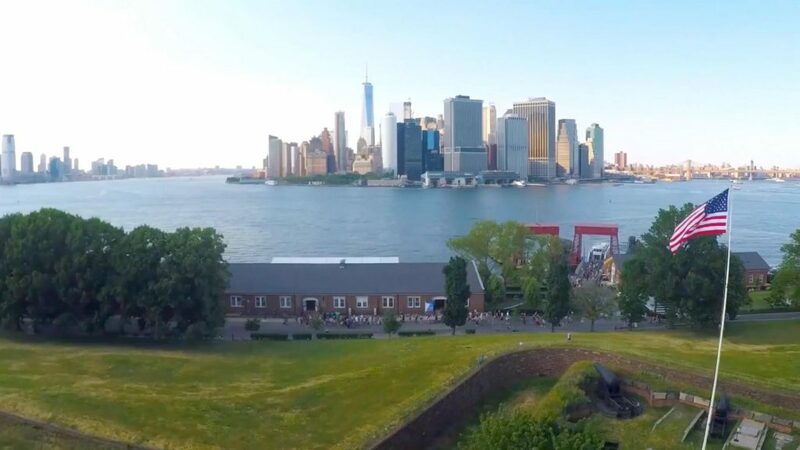 Governor’s Island is only open during the summer season (May Through September), which is the best time of the year to visit if you are an outdoor concert goer, or a fan of music festivals, foodie events and more. There are so many activities happening there, you can check out more information on their website. A hidden gem in Uptown Manhattan, NY is Fort Tryon Park! I totally love going there, and it’s very conveniently located near the A train’s 190th Street stop. Fort Tryon Park extends from 192nd Street and Fort Washington Avenue northward to Riverside Drive near 200th Street. It is framed on the west by the West Side Highway and to the east by Broadway. You not only get amazing views but you can also visit my favorite place, The Cloisters (and no, I am not a nun!). The Cloisters is a museum in Fort Tryon Park specializing in European medieval architecture, sculpture and decorative arts, with a focus on the Romanesque and Gothic periods. It is is located on 4 acres (1.6 hectares) inside the Park, overlooking the Hudson River. Who knew that such a gem existed in Washington Heights. A must-see and a great spot for pictures! Even if it is not free of charge, but rather than taking the underground subway (both same price – $2.75) into Queens, to get the best views and probably to find things to do in Queens for the day, I suggest that you take the ferry from the NYC East River into Long Island City or Astoria Queens, since it is super affordable and you can get incredible shots, especially on a beautiful day. I recently took the East River ferry and it was super quick and what a scenic ride! 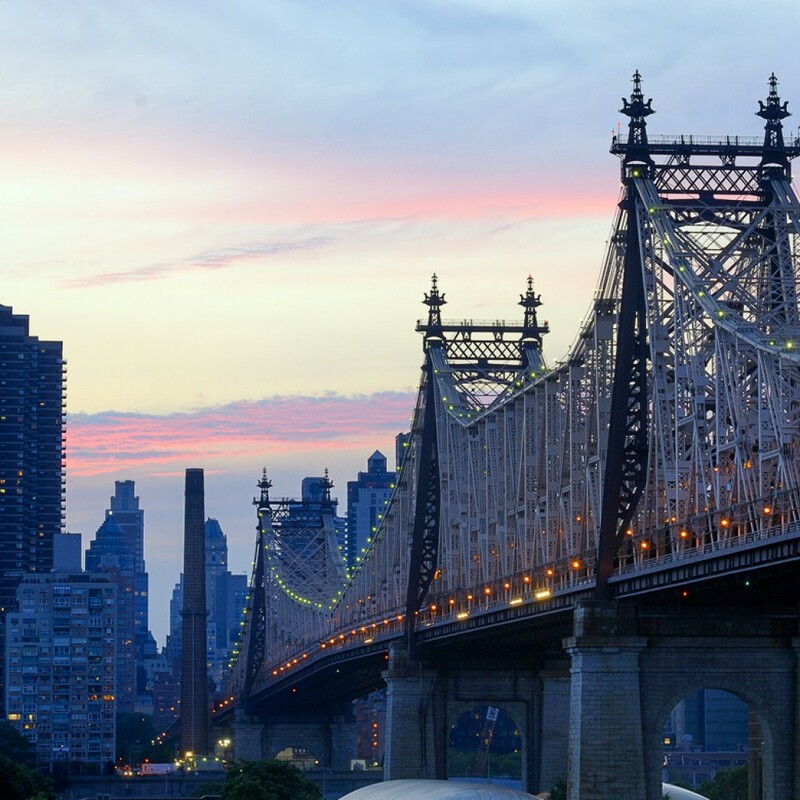 A lot of visitors stay in Manhattan and forget about amazing boroughs such as Queens, NY. There are so many things to do in Queens. I have been a local of the Astoria and Long Island City areas for the past 10 years and all I can say is that, if you don’t make it to Queens, you are truly missing out. Another amazing location to get the best views of Midtown Manhattan, and one of my top favorite ones as a NYC local, is the Long Island City Waterfront at Gantry Plaza State Park. I really love how, from the Long Island City Promenade, you can get the best full panoramic view of the east side of Manhattan. I totally enjoy walking along this promenade. In the summer there are so many events in the area, especially on the LIC Landing. You can also enjoy wine or coffee from the brand COFFEED (which can now be found in so many different places around NYC). I totally remember when COFFEED had only one spot next to my old apartment in Long Island City (which is the COFFEED LIC flagship). I used to walk there to get coffee, snacks and to work remotely. Last time, while I was walking around Times Square, I even saw one COFFEED stall there. It is nice to see how much the brand has grown. I might be biased since Astoria is one of my favorite neighborhoods in New York. There are so many things to do in Astoria, especially eating. It is a foodie’s paradise with food options from all over the world. Anyhow, going back to the views, you should visit Astoria Park. You can get beautiful views of the skyline. I enjoy walking around the park and sometimes sitting there because it’s such a relaxing place to people watch too. There is also a public pool (one of the oldest and largest in NYC) and for those traveling to New York with children, the children’s park is very well maintained. It is so nice to watch the sunset from there, next to the river, enjoying the NYC Skyline views overlooking the Bronx and Manhattan. You will see dramatic views of Hell Gate and of the Triboro Bridge. Walking the Brooklyn bridge is the most amazing experience, everything from the architecture to the free views of the breathtaking NYC skyline and 360 degrees views of the NY harbor. A must do while visiting New York! A great spot to catch the ferry and the views. Another way to cross the pond if you do not want to walk the Brooklyn Bridge. Dumbo is one of my favorite neighborhoods in New York City. I love walking around the waterfront and taking pictures. There are so many beautiful streets and small alleys for perfect photos with the Manhattan Bridge behind you and, of course, the Brooklyn Bridge. It is great to just cross the Brooklyn Bridge first and then end up in Dumbo or you can also take the F train to York Street station. If you keep walking, you can find it after Dumbo or just get off at the High Street Brooklyn Bridge Station (A or C train). Super nice views of Lower Manhattan and a great stroll. The promenade has benches for relaxing and it is less touristic. And easily accessible by crossing over the Brooklyn Bridge. This is a posh residential area of elegant brownstones, nice children waterfront playgrounds and an amazing tree-lined promenade along the East River. The views are incredible of Manhattan and the Statue of Liberty. I love sitting on the benches for people watching and to take in all of the views. As you can imagine, the neighborhood also attracts visitors and local families to the landscaped walkways of waterfront Brooklyn Bridge Park. Locals hang out in the area since there are great restaurants, cafes and bars around Henry Street. Williamsburg is a cool hipster neighborhood with great music spots, street art, cafes, restaurants and of course, a great waterfront with incredible views of the Manhattan Skyline. Tip: Stop by The Ides Bar inside the Wythe Hotel for drinks and to enjoy the sunset with the NYC skyline views. You will love the decor and all. If you do not want to get lost, for a minimum cost, you can take an uber to the restaurant. There’s also a small subway system and there are buses as well. You can use your unlimited (or pay as you go) metrocard for both. 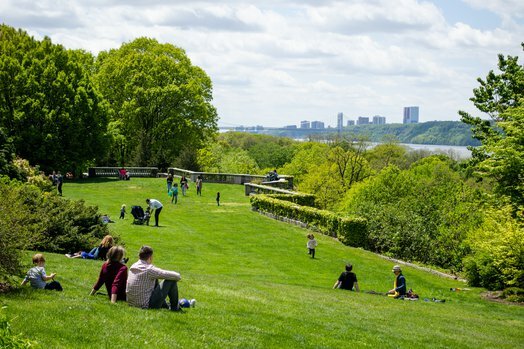 If you are visiting the Bronx, to visit the Bronx Zoo or other attractions, you can get nice views of the skyline from Wave Hill a 28-acre estate in the Hudson Hill section of Riverdale. A little more of a commute from the city center, but it is definitely a beautiful public park with horticultural gardens and a cultural center. Many many years ago, I used to live in the Riverdale area, which is pretty nice and also not far from Upper Manhattan. Wave Hill is situated on the slopes overlooking the Hudson River, with expansive views across the river to the New Jersey Palisades. Having lived in New Jersey for 3 years (and when I say Jersey, it’s practically Manhattan since I was in Weehawken, a city located right off of the Tunnel, 15 minutes away from NYC). I can testify first hand to the amazing views that can be seen from there. Hi, some of the best views of NYC are seen from New Jersey. I used to take the bus every day and I never tired of the views. I totally miss that. Very close to the city, 10-15 minutes away (depending on the traffic) from Port Authority Bus Terminal, you can take a bus that runs along Weehawken’s Waterfront Park with several stops along the way. You will definitely see the spectacular views right away even from just sitting on the bus. NOTE: The bus to NJ is 3 dollars, but you can stroll around the area and enjoy the view free of charge. There are also amazing Cuban Restaurants and other cuisines in the area. This park is easily accessible by taking the Path from Penn station. The PATH is the rail train that connects Manhattan to areas of New Jersey such as, but not limited to: Hoboken, Jersey City, etc. If you have a pay as you go Metrocard, it will be two of those rides for a round trip on the path train. NOTE: You cannot use your unlimited New York Metrocard for the PATH Trains. Once in Hoboken, there are also many places to dine and shop along the main Street called Washington Street. I love having a pot-luck picnic with friends at the Liberty State Park in Jersey City, while admiring Lady Liberty, overlooking the NYC skyline. Same as Hoboken, you can take the PATH train here and it is super convenient and fairly easy to get to. This is another of my favorite places especially over the summer. Plus, Jersey City has become a very trending neighborhood with great spots for brunch, dinner, drinks and fun. Every time I go, I’m pleasantly surprised to see how many new places have opened. I totally recommend that you check out this park and city for a different experience outside of NYC, while enjoying the best views of NYC. 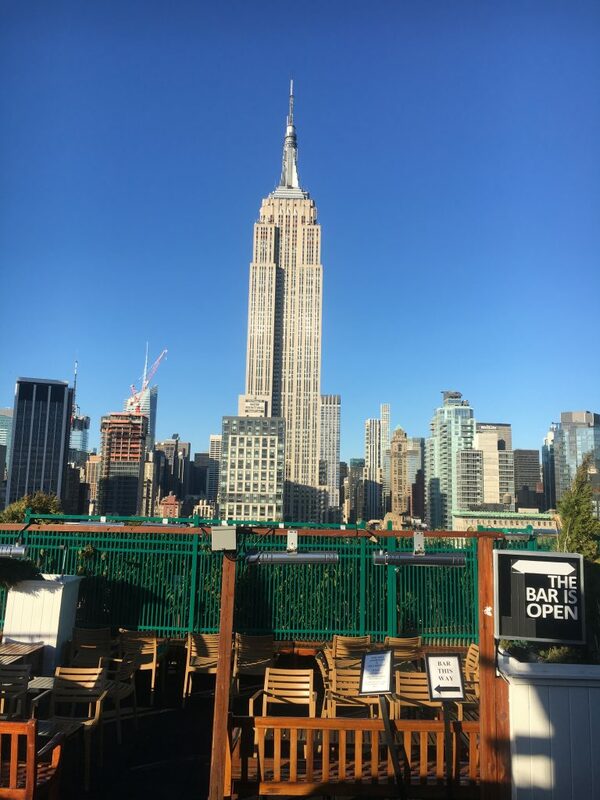 If you are in the mood for a cocktail, here are some suggestions of rooftop bars in Manhattan where you can get a great view free along with the cost of your drink. One of my favorite rooftop bars is 230 5th Avenue. The admission is free and you can go to straight up to the roof and take in some awesome shots with the Empire State Building behind you. 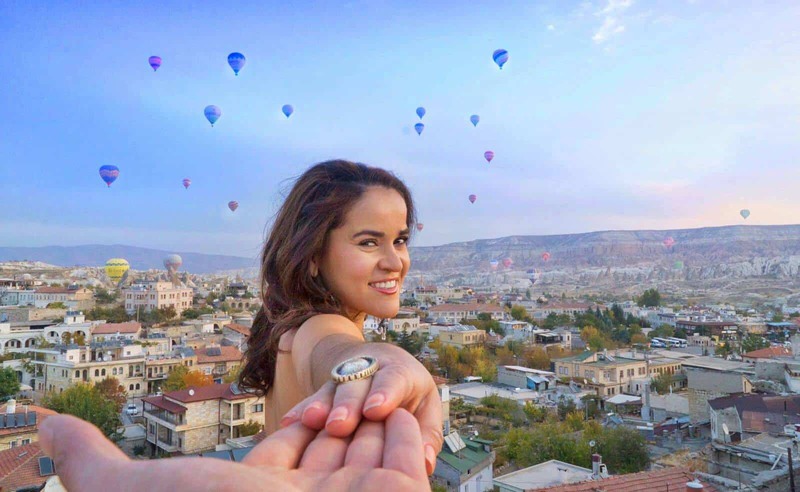 Great photo opportunity! I do know if you go there, you might be tempted to get a cocktail to enjoy with the view but my tip to you is to go during happy hour! Luckily, 230 5th Avenue has one of the longest happy hours, starting at 2:00pm. The happy hour has great deals for drinks and appetizers. I usually go there for that too. If you go a little later (since the happy hour ends at 7:00pm), you can probably stay late enough to catch the Empire State Building all light up behind you in your selfies. Heading to NY in the winter time? Not to worry since 230 5th Avenue offers you a red robe to wear on the rooftop and, to keep you cozy, they also have outdoor heaters and in the recent years inflatable igloos to sit in. Also, there are many hot drink options to help keep you warm. Honestly, it’s one of my favorite rooftops anywhere! Another favorite rooftop lounge for me is Press Lounge, due to their incredible views, delicious drinks and great music. The Dream Hotel Penthouse Rooftop Lounge also has great opportunities for amazing views of the Manhattan skyline which includes a direct line of sight to the Hudson River. The crowd is usually very nice and the lounge turns into a big party every night. *There are so many other rooftops bars in New York City that I love, that you should look out for another post coming soon. Another way to get the best views of New York City is actually from the sky. Nobody can argue that a helicopter ride is one of the most amazing ways to see New York from above, even though it does comes with a price. But if you can afford it, you are in for a treat! I recently went on a helicopter ride over New York City and it was epic! Last but not least, if you want to combine your love for museums with a cocktail and a view, the perfect place to go is The Met Roof Garden Cafe & Martini Bar inside the Metropolitan Museum of Art (MET). The views from there are impressive. You won’t regret it. Plus, the MET is one of my favorite museums in the world. If you have the time, you should visit it and enjoy the spectacular exhibits. There are always many boat and cruise tours options in NYC. Some of them have even themes, such as architecture, for beer lovers, celebrating the holidays, Harry Potter, dance parties, etc. What a great way to meet people with similar interests. There are champagne and sunset boat cruises and some that only circle around the Statue of Liberty. Also you can find complete packages with bus, boat and walking tour activities. 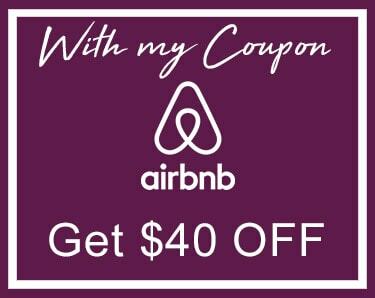 It’s a great way to save money by bundling activities and see New York City from many different locations. I hope that this list of spots, where you can enjoy the best views of NYC for free, helps you to see New York City from a new and unique perspective. I promise you that the exploration will be worth your time and that you will fall in love with NYC again and again. Happy Best Free Viewpoint chasing! These are AMAZING spots!! I’m saving this post for next time I visit. I always get giddy when I see the NYC skyline, so any excuse for a good view of it, to be honest. Thanks for all the tips!